- We are presenting the newest product of our time - 3D printers of our own production. 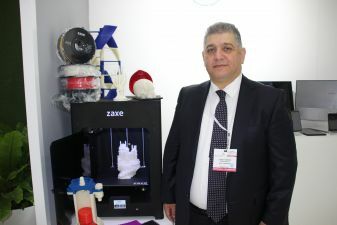 Three-dimensional printers are able to ensure the rapid growth of industry, for which they have already been called as the fourth industrial revolution. The equipment is made in Turkey, we want to open a similar production in Azerbaijan. With the support of the Azerbaijan High-Tech Park, we plan to start implementing the project in the near future. 3D printing allows you to create volumetric objects using a variety of materials, mainly plastic. In the near future we will start producing printers that create metal objects. Three-dimensional printers are designed to quickly create prototypes of parts, or an object in the complex. The user sends the image of one or another object to the printer and receives the finished product at the output. And it is possible to immediately get the product with moving parts. Such printers are indispensable for engineers, equipment developers, inventors, etc. Ordering the production of a single item in an enterprise is expensive, while on a printer it can be created with minimal expenses. The presentation of the volume printing capabilities of the Azerbaijani audience was successful. We will be happy to meet with architects, engineers, representatives of manufacturing companies, the defence industry, etc. I want to thank everyone who assisted us in participating in this exhibition. The event is perfectly organized and allows you to present products at the international level.